The Blue and Gold Banquet is a family affair providing the entire Pack an opportunity to come together and to share a festive atmosphere. For Packs all over America the Blue and Gold Banquet is one of many highlights of the scouting year. The event is often thought of as a birthday party for the Cub Scouts. One that is celebrated on or around the anniversary month of the Boy Scouts of America which was organized in February of 1910 with the Cub Scouts being organized 20 years later in 1930. The primary purpose of the Blue and Gold Banquet is to observe the Pack's anniversary, acknowledge the Packs leaders and any other adults who have been instrumental in the Pack's success, to inspire the Pack's leaders, Scouts, and parents. Some Packs take the opportunity to invite former members and other community leaders to the banquet to speak to and inspire the current Pack. The actual dinner can take place in a restaurant or catered in an indoor or outdoor facility, or any other style as planned by the Pack and banquet committee. Ultimately it's not the activity of eating that's of importance, it's the celebration of the scouting that has taken place leading up to the event and for that which will follow the event. It's about bringing scouts and their families together in a friendly environment where they can all share a day or evening of fun - not to mention the opportunity to be recognized for scouting advancement and its related awards. Planning for the event should begin at least two or three months in advance of the dinner. Attendance for this event is normally much higher than the monthly Pack meetings so this two to three month period of planning gives the Pack a greater chance for success. 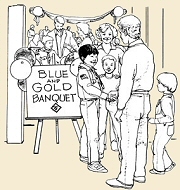 The Blue and Gold Banquet planning committee should be made up of parents and possibly some of the senior scouts who can plan a memorable activity for the birthday party. Depending on plans and the Pack, decorations for the dinner party can be as elaborate or as simple as you wish. Some Packs actually incorporate Den activities for the manufacturing of such supplies (for example table centerpieces) leading up to the dinner date. The day of the event the Dens should sit together. Guest should be greeted at the entrance and seated by a host(s) with their respective Dens. The Banquet might include entertainment of some sorts related to the dinner theme chosen by the committee - Pack movies, Pack slide show, singing or other activity to make the dinner festive. This site is not supported nor sponsored by the Boy Scouts of America and as such should not be regarded as official. Any errors or omissions in the content of the website are unintentional, please contact us with any that you might find.